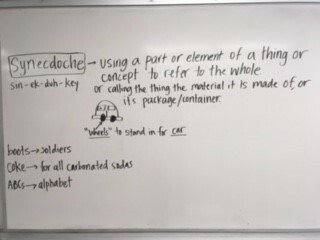 Learn the terms synecdoche & metonymy. Write drafts of our 3 items that reflect an issue. Explore reliable research databases, such as Ebscohost's Explora (see page tab above). Ms. Leon is being recognized for Honorable Mention for the Chula Vista CLEAN Sustainability Champion Award in the Teacher category, which recognizes an educator for environmental leadership in their community. The award will be presented to her at the Chula Vista City Council Meeting on Tuesday, 4/16/19 at 5pm. The address is 276 Fourth Avenue, Chula Vista. 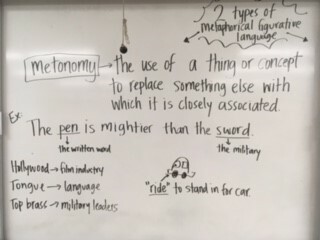 Paragraph 1 = A _________. A ____________. A __________. 2-3 paragraphs about the item. The ______. The ______. The _______. The Social Fabric Initiative, a program of the Kroc Institute for Peace and Justice at the University of San Diego, is looking to spread the word about our program. We were hoping you could pass this news along to any students who would be interested in applying for the program. This summer, high school students will collaborate in a small team, or Thread, with university Interns and a field-based Mentor to create a community change project. The Social Fabric Initiative’s goal is to engage youth as agents for change to build more connected and peaceful communities in San Diego. We understand that our tuition may present an obstacle to students interested in applying. Please encourage anyone interested that we offer scholarships for up to 100% tuition. These scholarships are not just awarded based on need; we also award scholarships based on passion for the program. To apply for a scholarship, just fill out the scholarship section at the end of the Youth Peace Leader application. Look Global Scholars, our letter had impact! Hi Gina – thank you for sharing the project with your students and collecting and providing their feedback – very thoughtful and creative! I will provide this to the parks design team and it will be considered with the rest of the community feedback that will be used to create a final design for the parks. If you’d like to view the presentation from last night’s Sweetwater Park Design Workshop and/or take the survey, please visit our Chula Vista Bayfront page at https://www.portofsandiego.org/projects/chula-vista-bayfront. There are currently two design options – EcoTones and Life Cycles. I’d also encourage you to sign up on our email notification list to be notified of the third and final parks design workshop to be held later in the spring – likely in June. The link is on the aforementioned page. We’d welcome you and your colleagues as well as your students and their parents! Editorial writers build on an argument and try to persuade readers to think the same way they do. Editorials are meant to influence public opinion, promote critical thinking, and sometimes cause people to take action on an issue. In essence, an editorial is an opinionated news story. 11. Keep it to 450 words; make every word count. Because we had to change the date of the Performance Task administration, your editorials will be due FRIDAY instead of tomorrow, Wednesday. UC San Diego will be holding the 4th annual Splash event for high school students on Saturday, April 20th. During the day, a variety of classes and workshops designed for high school students are taught by UC San Diego faculty, graduate students, and undergrads. There are dozens of different course offerings, spanning engineering (e.g., nanoengineering, materials science, robot localization and many others), math and computer science (e.g., game theory, data analysis, etc. ), biology and medicine (e.g., ant navigation, global health, appendicitis) and arts and humanities and social sciences (e.g., Greek philosophy, modular origami, contemporary dance, etc.) along with some practical classes particularly relevant to high school students (time management, surviving freshman year). Registration closes April 16th. Classes fill on a first-come-first-served basis, so we suggest you register as soon as possible. Additionally, since shirts must be ordered in advance, we cannot guarantee you a shirt if you register after Wednesday, April 3rd. My grade book is on Jupiter Grades for you to view. There are some things you need to know. If you have a blank score that is not bad. Often scores are left blank when I do not grade an assignment right away. Sometimes blanks mean a student was absent for an in class experience. The point is do not panic about blank scores. Missing assignments (M) however, are a real problem. Students get "M" when they do not turn in an assignment that they should have done. Students can usually undo a "M" by turning in the work late. Often I do not enter many assignments until the end of the grading period when projects we have been working on for a few weeks become due. I try to enter progress grades every few weeks into the "progress category." Note that the progress category is only 10% of the total grade. Low scores on progress grades indicates that a student needs to improve their work before the final project is due. Student grades are based on meeting grade level standard proficiency. This is not a points or numbers game. There is no extra credit, but there may be additional opportunities to show proficiency, including revision & resubmission. I hope this will resolve some confusion. Of course if you have questions about grades please e-mail me.